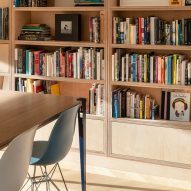 Gruff Architects has incorporated plenty of storage and blocks of bright colour into this top-to-bottom renovation and extension of a London house built in the 1930s. The 141-square-metre Bearstead Rise was previously a typical terrace house, with a loft conversion and outbuilding added in 2006. The owners wanted to create a home that was better suited to a young modern family such as theirs. 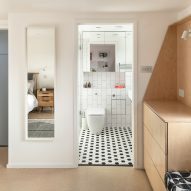 Gruff Architects – which is based in Brockley and headed up by Emily Burnett and Rhys Cannon – began by ripping out the ground floor, replacing the awkward room arrangements with an open-plan area for living, dining and cooking. The rear elevation was extended and opened up to the previously disconnected garden. Here, the practice has also transformed a disused outbuilding into a modern tool shed for the client who works in the tech industry. The first floor of the house is now used as a space for the clients' twins, while the second-floor loft conversion accommodates a master bedroom with en-suite bathroom. The house's individual floors and spaces are linked by recurring materials and joinery that create consistent "connecting ribbons" and visual references. 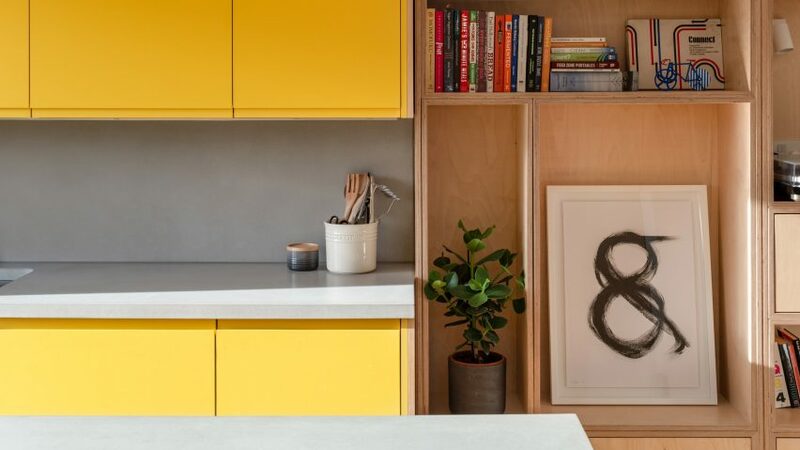 Neutral but warm materials and colours such as cork floor tiles, engineered timber floorboards and birch ply joinery form the fabric of the building, while concrete floor tiles, zinc yellow kitchen door fronts and an anthracite grey staircase are used to highlight key elements. "Although the main house, garden and home office exist as individual elements, by the use of repeated materials and neutral aesthetics they become visually linked, with the garden acting as the transitional outdoor area," said Gruff Architects. "This consistent palette links both different levels and different functions of the house." 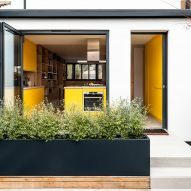 A bright yellow kitchen is located within the rear extension, leaving ample remaining space for living and dining in the front half of the ground floor. 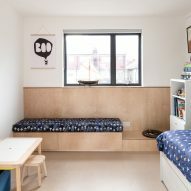 Here, the architects added a floor-to-ceiling modular and adjustable birch ply storage wall and window seat. The area is used as a space for entertainment and relaxation, as well as a space to display books, photos and memorabilia. 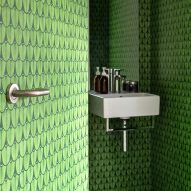 A small bathroom decorated with distinctive scalloped green wallpaper and geometric green and white floor tiles sits opposite. A painted timber staircase with shadow gaps and recessed handrail has also been inserted at ground level, along with built-in storage that's concealed behind birch ply doors. On the first floor, the children's bedrooms are a mirror of one another while providing each child with their own personalised space. A secret door within the bedrooms' adjoining wall gives the twins the option of unifying their rooms to create one large play space. 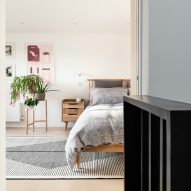 Bespoke built-in birch ply storage, as featured on the ground floor, is also used in the bedrooms across the upper levels of the home. The rear extension to the ground floor features a set of glazed pocket and bifold doors that open up to a landscaped garden, with decked terraced seating, steps and planters. A concrete pathway that the architects refer to as "a material ribbon" runs from the front entrance to the side of the main living area and into the garden, where it leads to the client's new home office, workshop and gadget station. The home office was designed to mirror the main house with large bi-fold doors that open up to the garden area. "Rather than a simple extension to modernise the house, with Bearstead the challenge was about reinventing the pre-existing plan itself," said the practice. "By listening to the client and understanding their needs for the space, we came up with a design that fused the new with the old and created a seamless and flexible new interior by adding material, colour and texture together." 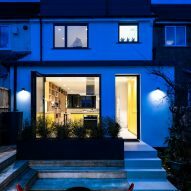 Other recent terrace renovations include a 1960s home in north London, which Archmongers refreshed with a glazed tile facade. Meanwhile architecture and interior design studio Project Orange extended a home in central London to provide more practical spaces for a family that hosts a monthly dining club. Photography is by French + Tye.